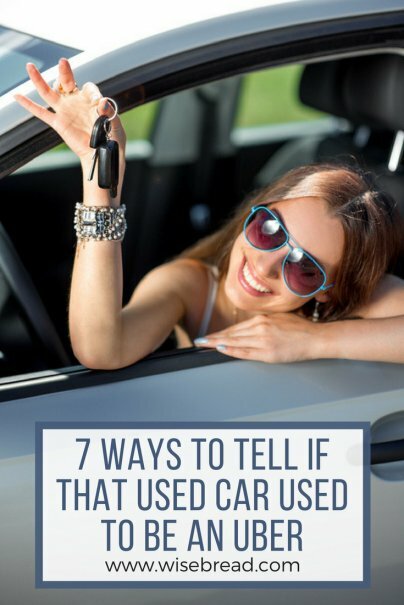 There are plenty of things to consider when buying a used car: the vehicle's make, model, mileage, and accident history. One potential deal breaker that you may not have even considered is whether the vehicle was used for ride-sharing services like Uber or Lyft. According to the U.S. Department of Transportation, Americans drive an average 13,476 miles annually. Any odometer with 20,000 miles or less per year shouldn't raise red flags. It's when you get into the 40,000-to-50,000-miles-a-year range that you should ask about whether the vehicle was used for commercial purposes like deliveries or ride-sharing, even if it's not listed as such. When you review the Carfax vehicle history report (and you should), take note of any fender-benders and other repairs to the vehicle. If there seems to be an unusual amount of these occurrences, there's a possibility the vehicle was used for ride-sharing. The likelihood of getting into accidents and experiencing other damage is higher for Ubers than standard personal-use vehicles because the former is on the road much more often. In all markets, ride-sharing vehicles are required to display the company's emblem, which is often adhesive, on the windshield. Uber and Lyft both offer non-adhesive emblems in some markets, so you might have to look a little harder. For instance, search for signs of smaller stickers from permits granting the right to service airports. Those are now required in certain areas. The longer these stickers are affixed to the glass, the harder the adhesive is to remove completely, even when the sticker is peeled off. If the residue doesn't look like typical DMV required stickers, it's likely from a permit of some sort. Sure, anybody can leave a stain by accident, but if it looks like someone has vomited on the back seat, someone has probably vomited on the back seat. It could've been a child, or it could've been a drunk guy. You make the call. "You should also look at the condition of the upholstery and the padding underneath," says Jim Milan, communications manager for Auto Accessories Garage. "Most vehicle seats should stay in pretty good shape even over the years, while an Uber or Lyft might seem especially indented or may show some light tearing around the seams. If the bucket seats seem a bit too bucket-y, be wary." You might get lucky. The previous owner of the car may leave evidence hidden in the car that reveals its past, such as an airport permit or extra Uber stickers, says Harry Campbell, author of The Rideshare Guide. Inspect the glove compartment and any vehicle pockets for indications that the vehicle was used for ride-sharing. You know how all the wood railings leading to amusements park rides are super smooth from years of people touching them with their oily hands? Well, the same sort of thing happens to the side armrests in cars as a constant flow of passengers opens and closes the doors and rests their arms and hands on them. If these areas look worn — and there are no other signs that kids dominated the back seat — take it into consideration. Another sign is when the symbols on the window controls in the back seat are rubbed off partially. Sporadic back seat passengers wouldn't cause that much fading. If any of the above signs raise your suspicions, you can always ask the seller if the car has been used for ride-sharing. They may not tell you, but if they do fess up, take that into consideration when negotiating the price. If they won't tell you, or if you're still in doubt about the car's history, it may be time to pass the car by and look for a vehicle you can feel more confident about.